The rare coin industry has demonstrated an impressive history of long-term capital appreciation that has attracted diversified investors for generations. Rare coins are somewhat like a silent chronicle of our western civilization. They illuminate the commercial histories of historically important cultures; some of which have evolved into modern economical titans while others have slipped with barely a whisper into the mysterious world of ancient history. In either case, rare numismatic specimens will always be desired and competed for as long as people covet wealth and enlightenment. Coinage, the first readily transportable wealth, is the most important invention of western civilization and those who have collected them through the ages have been traditionally rewarded with an incomparable storehouse of tangible value. Numismatically meaningful collections have proven to be sophisticated options that preserve or increase personal wealth especially during inflationary cycles, which are never far away. 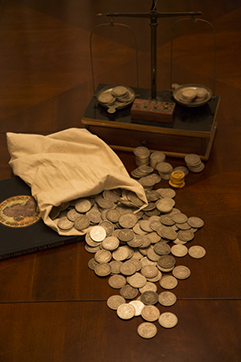 As a collector or investor, you will also be in rarefied company of royalty such as King Farouk, wealthy financiers as the Hunt Brothers, and celebrities from the entertainment and sporting world such as Penny Marshall, James Earl Jones, Buddy Ebsen, Jerry Buss, and Wayne Gretzky, all who have learned to enjoy the benefits of rare coin ownership. How does the rare coin market work? Factors that contribute to the value of a coin include the beauty of the design, a coin’s historic significance, its bullion of metallic value, and the number of coins known to exist. Surprisingly, age is not always the most important factor. There are U.S. coins issued within the last 50 years that are worth thousands of dollars. By comparison, there are 2,000 year old ancient Roman coins worth less than $10. Rarity: Rarity can be defined by the number of coins minted in a particular series, or the number of coins known to exist. Rarity is an important consideration because in general, the rarer the coin, the higher its value. Popularity: Coins in a popular U.S. series will sell for more than coins in a series collected by only a few. Condition or Grade: As coins enter into circulation, portions of the design are warn away and the coin becomes less desirable to a potential collector. Some coins received fewer contact marks at the mint or have been more careful preserved since their striking. A coin in uncirculated or mint state is worth more than one of the same variety in a lesser state of preservation. Market: The coin market fluctuates in sometimes cyclical patterns, thereby affecting price and consumer demand. Recovered from the wreck of the SS Republic which sank in 1865. With a great variety of designs, this octagonal series started in 1892 when the U.S. minted the Isabella quarter. This was the first of a new tradition for the coin industry as the government began to mint limited issue coinage to commemorate great events. 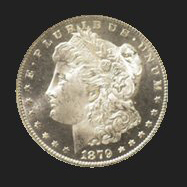 Morgan Silver Dollars were minted from 1878 – 1904 and then again finally for the last year in 1921. 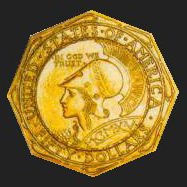 This example was struck at the Carson City Mint in Nevada. 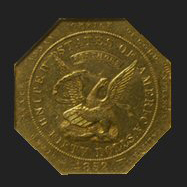 The fifty dollar gold piece features a large eagle on the obverse and a decorative circular design on the reverse. This very attractive coin is one of a few surviving Mint state examples. 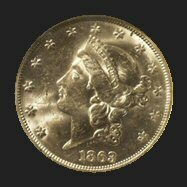 In 1852 a newly reorganized company known as the United States Assay Office of Gold took over the government contract to strike coins. The Assay office was a provisional government establishment up until 1854 when it officially became the branch U.S. Mint of San Francisco. Minted until 1933 gold coins come in a variety of dominations all magnificent in design.